I am still a firm believer that the best targeted traffic on the internet is traffic that comes from the organic search engines. This is not to say that you can’t buy good traffic. There are many programs out there selling traffic and claiming that their traffic is better then the next guys. When ever you’re paying for anything on the internet you need to be careful, especially when it has anything to do with building an online business. Just as there are many scams trying to sell you their online training programs, and promising riches beyond your wildest dreams, there are also many traffic programs selling their traffic and promising you the best targeted traffic you can get, that end up being worthless. Lets break this down into the different types of traffic that you can pay for, and then narrow it down to which ones you could possibly benefit from and which ones you should stay away from. 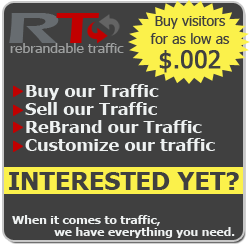 RT Rebrandable Traffic: RT is a fast way of getting traffic to your website and works especially well while you’re waiting for your ranking to climb with Googles organic search. RT is traffic that is gathered from the internet and redirected to where ever you want it to go. This can be good targeted traffic if you use the keyword box in the campaign editor correctly. You are aloud to enter up to 10 targeted keywords into each campaign you create. Depending on your keywords would depend on what kind of traffic you will receive from your campaigns. Your traffic is generated from the different sources listed below. The price for this traffic is literally pennies per click, so it’s very easy to determine whether or not it’s worth it without spending a lot of money. Build Your List: RT Rebrandable Traffic is the perfect kind of traffic for building a list. If you can get this traffic to convert into an email list you will be way ahead of the game. Once you have an email address, now you will be able to market to that person over and over again. If you’re not collecting emails for your list then chances are you will never see that person again, they will end up being someone that just passes through. Convert Your Traffic Into Cash: If you don’t have an email list yet, you can learn all about how to build an email list from scratch in an article that I put together that teaches you step by step how to build an email list fast that converts into cash. 7search: 7search is another PPC “Pay Per Click” source that is not so well known. The fact that they are not as well known as the heavy hitters like Google, Bing and Yahoo gives you a little advantage as far as pricing goes. You can easily set up a campaign and choose your keywords with prices that range in the pennies per click. You can also set your own daily budget so you will not run over the allotted amount you’re willing to spend. You can see a wealth of traffic sources in the list I have provided above that will generate more traffic then you can imagine. The task is to go through them and find the ones that will provide the best results for the niche that you are targeting. I have listed a few of the traffic sources that I personally use above with a brief explanation on each of them. Traffic is the thing that we all strive for in business, without it we are dead in the water like a ship without a sale. There are thousands of ways to generate traffic to our websites and part of the process of success is finding the formula that works best for you. The first thing in the process is to form a reputable list and from there you would want to start testing each one. Some of them will prove to be better then others, but as I said in the beginning of this article you always need to remain focused on generating organic traffic from the search engines because this is the traffic that will convert better then anything that you can pay for and this is the traffic that will last for years to come without having to spend money on it. What ever you’re doing to generate traffic to your website the number one focus should always be providing fresh, quality content to your readers that will serve to help them in what ever your niche is. This is truly the key to building a successful online business in today’s world. You can buy targeted traffic that converts, but you will never be able to replace organic search engine traffic conversion rates if you are providing fresh content on a regular basis. You can get complete online training that will teach you how to build and monetize a business website for any niche, and how to generate quality organic traffic to your website through content creation and many other sources. Anyone can buy traffic that converts, but not everyone can build an online business that actually creates a full time online income. Please leave any comments or questions in the comment box below and i will be glad to help you find the best traffic available to your website. Great read Wayne! I agree that content to drive search engines is the best source of traffic. I’ve used the pay for traffic programs, and the did what they said they would do. They sent me a ton of traffic! That 7search sounds interesting, I may have to check them out! Be good man! There is an art to both of them. Traffic is the one thing that people seem to have trouble with and it’s the one thing that everyone needs to be successful. If your paying for traffic and sending it to a website or page that isn’t set up properly for conversions, whether it’s getting an email address, making a sale or getting a sign up for your webinar you’re wasting your money. There is definitely a process to follow and buying traffic isn’t something for newbies. It’s to easy to get burnt. I pay for traffic on a very small scale and if it works then I will increase my budget a small amount and keep doing the same as long as I know that my return is at-least as much as my investment. Good luck with your traffic Rod and if you need a hand with anything don’t be afraid to ask. You have provided a very clear and concise breakdown of different ways in which to get traffic to your website. This is exactly at the point I am at in my website development and your information has been very helpful. Approximately how much would a person need to spend on Google AdWords to get some traffic to their site? I look forward to reading more on your site! One of the things you need to be aware of when buying traffic is you can not jump in with both feet. You need to move very slowly and learn what works for you. This is exactly why I have included the options of RT Rebrandible Traffic and 7Search. Both of these are low budget traffic sources that you can experiment with and not loose your shirt in the process. Once you have navigated your way through the learning process and you know what you’re doing you can spend as much money as you want to. How much a person needs to spend is not the question. The question is how much a person wants to spend. Paying for traffic shouldn’t be something you look at as spending money on. If you’re good at PPC the mission is to have your traffic pay for itself and produce a profit in the process. If you can learn how to do this then it will never cost you a penny. The traffic needs to pay for itself! Great article with some really useful paid traffic sources. Would you include facebook ads in this list? I am not sure if they are also targeted. I’ve heard that it’s possible to set a ceiling limit on the PPC spendings in google Adwords, but have not really used this myself. You would need to have a pretty well-tested conversion rate in order to keep your income larger than the cost of traffic, like you’ve said. I got a little confused about the RT Rebrandable traffic option. When you talk about siphoning traffic, am I right in thinking that this is just like buying ads on all of those different sources listed (but RT allows you to do it from a single platform instead of individually signing up for ads on each site)? If so, it seems like a pretty cool system. I don’t think I’m ready to delve into targeted traffic just yet as it doesn’t make sense with the conversion rates I’m getting. Would you only really use targeted traffic on sales kind of pages? When ever you’re paying for traffic you need to make sure you set limits on your spending. One thing you don’t want to do is give control of your spending limits to someone else. PPC does have all kinds spending limits that you can set. You can set a maximum amount you’re willing to pay on any keyword that have and even set different amounts for different keywords. You can also set a daily budget of what you’re willing to spend and once they have reached that budget they will shut your adds down for the day. As far as RT Rebrandable traffic goes they have their own traffic sources and its not the ones that are listed. All of the listed traffic sources are different types of traffic that you can try out and test on your own. I haven’t made it through the whole list yet but I have found a few that are worth paying for. There really is an endless supply of traffic sources on the internet and you need to be just as careful when buying traffic as you are with purchasing any kind of reputable training program. It’s just to easy to get ripped off and trial and era are the only way to find out the truth. Start off slow and test, test, test and you will be ok. There really are some good ones out there, you just have to find them. There is an art in buying targeted traffic from paid sources that actually works. It is true that the best kind of traffic that you can get is organic traffic. But it really takes time to build. So buying traffic works like an instant solution for people who do not understand how to generate traffic organically. I believe this is why people purchase paid traffic and will always keep buying. But the key is in buying the right traffic from the right traffic source. Most of the paid traffic out there is garbage.